It promises to be the drone for everyone. And everyone is putting big money behind the Ghost. A consumer drone from a Chinese firm called EHANG, the Ghost is designed to be incredibly easy to use. It comes fully assembled, connects to a GoPro (not provided), and is controlled with a smartphone app. EHANG founder Derrick Xiong opened up an office in Silicon Valley this summer with the intention of diving into the U.S. market. And boy, has he done so. Xiong, who has 55 employees, launched an Indiegogo campaign in November for Ghost. It exceeded its initial campaign goal of $100,000 within 24 hours and has since raised over $700,000 -- and it still has a few more days (the campaign ends on January 9). Moreover, just last week the company announced $10 million in VC funding, in a round led by GGV Capital, which is also an investor in Alibaba (BABA). According to Jess Perez, EHANG's marketing director, people have used the Ghost for everything from filming golf matches to walking down the aisle to driving up the West Coast. "There's so much opportunity in the drone industry to respond to what customers need and want," said Perez. By leveraging Indiegogo's platform, they've been able to size up what people want (adding "perks" like extra battery options and new colors based on user feedback). But testing consumer preferences -- and attracting significant investor funding simultaneously-- isn't common. "It's proving they've got a market," said Danae Ringelmann, co-founder of Indiegogo. The drones -- which are available for pre-order for $375 on Indiegogo -- will all be shipped by the end of the month. (Perez said EHANG has already shipped the first batch to backers). It's not exactly a surprise that both parties -- consumers and VCS -- are shelling out a lot for drones. Recent drone campaigns on crowdfunding sites like Kickstarter and Indiegogo have blown fundraising goals out of the water. AirDog, an auto-follow drone, raised $1.3 million on Kickstarter with a goal of just $200,000. 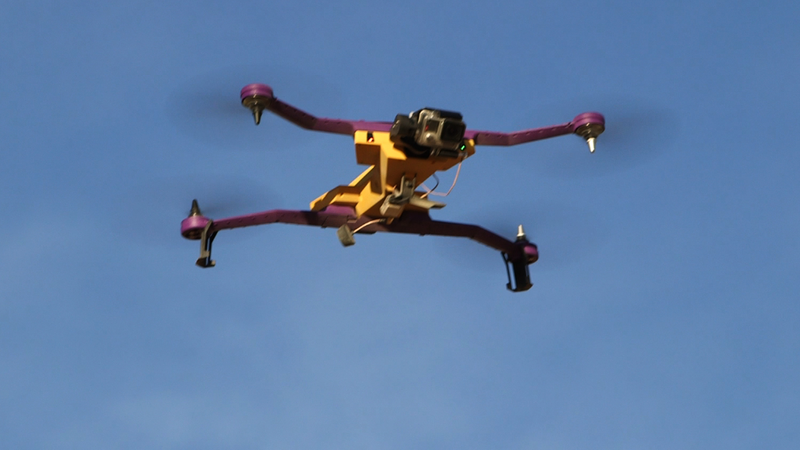 PlexiDrone, an aerial photography device, raised over $1 million with a goal of $100,000 on Indiegogo. And VC dollars have flowed to this sector, too. Some in sizable financing rounds -- like Unmanned Innovations (known as Airware), which raised $25 million in July. Venture capital funding for drone-related startups is very much on the rise. It totaled $412 million in 2014 -- up 44% from 2013, according to PrivCo preliminary 2014 data. That makes it the fastest growing tech sub-sector behind cybersecurity. PrivCo CEO Sam Hamadeh said that though the sector is still very nascent, funding amounts like Unmanned Innovations and Ghost Drones bode well for VC drone investing in 2015.